The past holiday season was anything but jolly for Annette, whose two beloved cats – a 20-year-old Burmese and an 18-year-old Tonkinese – both sadly passed away within a few weeks of each other. 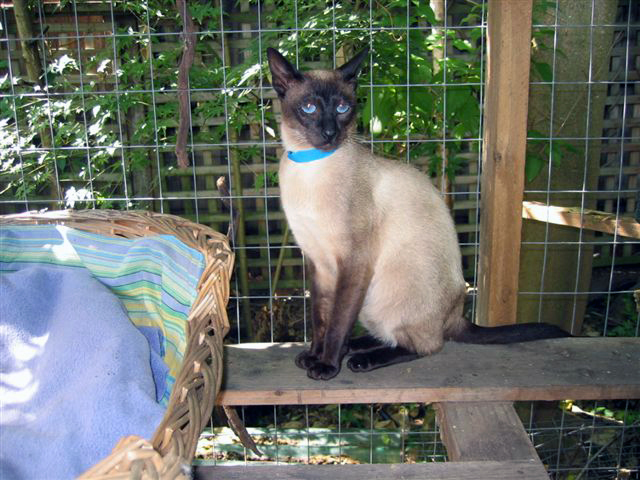 “My Burmese died very suddenly just after Christmas and my Tonkinese grieved terribly for him. He was already unwell but losing his friend just seemed to exacerbate his condition and he passed away as well,” Annette said. Despite her friends encouraging her to get out there and enjoy her retirement sans all the responsibility, Annette knew she wouldn’t feel complete again until she had cats in her life. A volunteer at Lort Smith Animal Hospital for 20 years, she had a strong understanding of what sort of feline she was looking for, although it didn’t prove to be easy. “I’ve always loved exotic breeds, but I’ve never had the budget for one,” she said. “I nearly fell of my chair!” Annette laughed. On her way to the North Melbourne shelter to meet the striking boy, Annette prepared herself for a rusty first encounter. She knew that Siamese cats can sometimes be very cranky when they are outside their comfort zone, as often breeders will breed more for looks than temperament. “I was expecting for Emperor to lash out at me when I first met him,” Annette said. Annette got exactly what she wished for with Emperor, who she describes as almost ‘dog like’ in the way he follows her around. But it seems when you wish for something hard enough, it can come true twice! After bringing the little kitten home and carefully observing Emperor as he got to know him, Annette said she was preparing herself for a great clash of whiskers! Luckily there was no aggression and within 48 hours, the two were best friends! The two boys spend their days frolicking in their very own, custom-made cat enclosure, which Annette said didn’t cost a whole lot but is priceless in terms of the cats’ safety and happiness. As for Annette, she said her world has finally gone back on its axis. While she still grieves for the two boys that have gone, Emilio and Enzio have brought her so much laughter and joy that she feels like the heart is definitely back in her home. “I think a lot of people who adopt think about what they are giving the cats – a new life, comfort, a home,” she said.